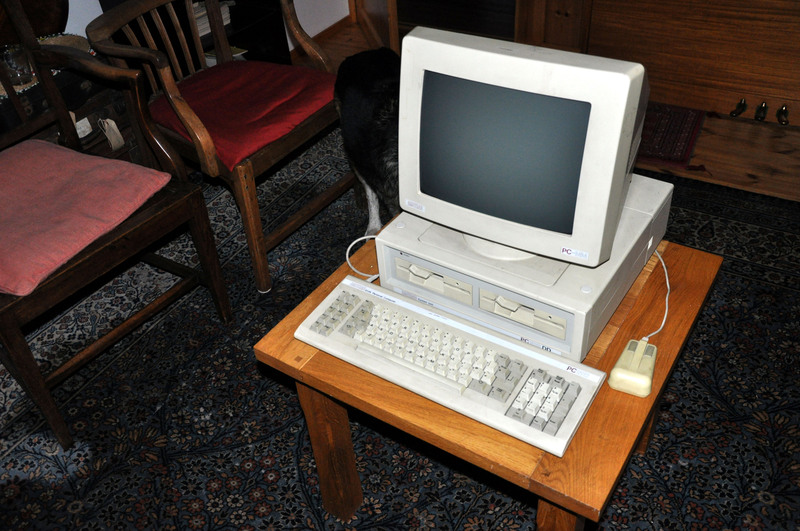 The AMSTRAD PC1512DD was introduced in 1986 at price of £499. AMSTRAD is a sort of acronym for Alan Michael Sugar TRADing. The base unit weighed 6Kg. The rear view shows the power cord going to the monitor; the power supply for the whole machine was in the monitor. In fullsize you can read the labels showing it was MADE IN KOREA. On the rear of the base unit is an RS232 25 pin input socket and a 25pin parallel output socket. 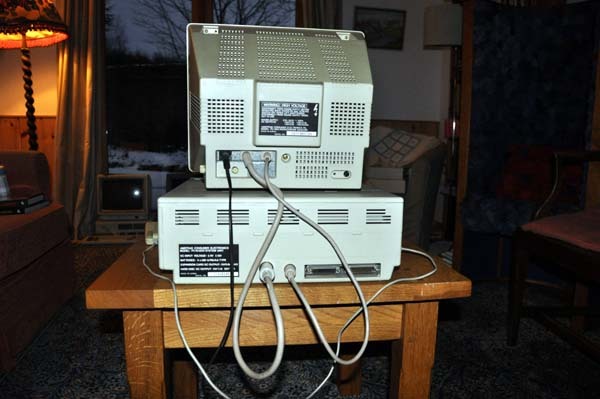 The RS232 was a serial port, the data was transferred 1 bit at a time and typically connected to a modem connected to a telephone line. 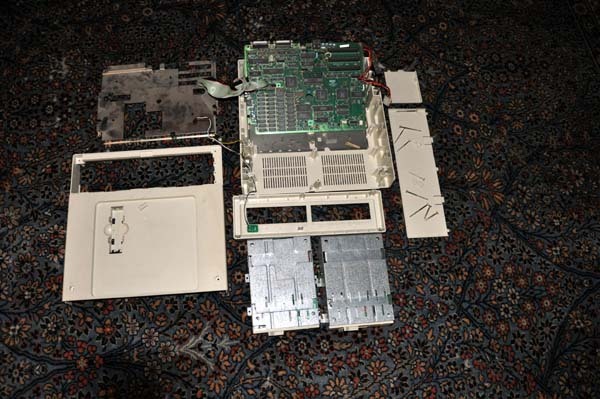 The parallel port transferred 8 bits, a character, at a time and typically connected a printer. The serial port was slow but could connect over long distances. The parallel port was fast but could only connect a short distance. Taking it apart reveals the components: base unit with motherboard at top middle; two 5 1/4" floppy disk drives bottom middle. Each stored 36KBytes. A closer view of the mother board. 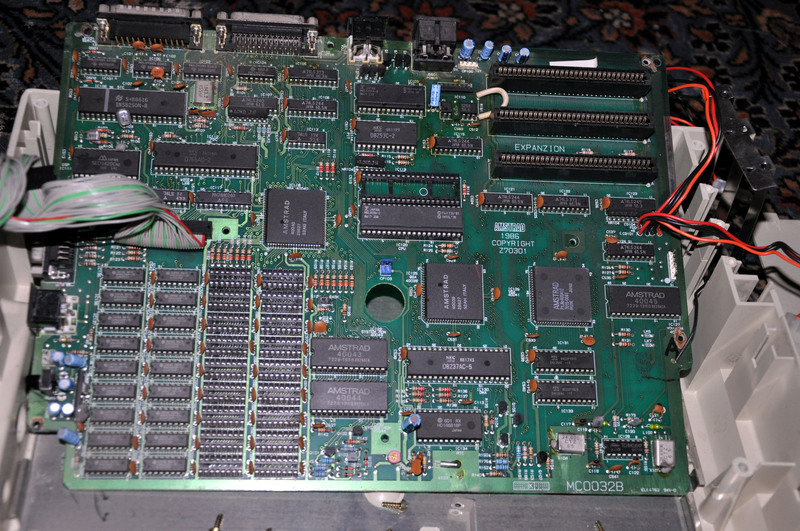 Just above the hole in the middle of the board is a 40 pin chip labelled: MBL8086-2. This is the 8MHz 16 bit Central Processing Unit. Above it is a 40 pin empty socket for a math coprocessor 8087 MCP. Bottom left is 2 x 9 chips of 512Kbyte memory and another 2 x 9 sockets for memory expansion. NEC 8610KD FDC Floppy Disk Controller? MBL8259A-2 PIC Peripheral Interface Controller?